The Wrangler is an SUV that has withstood the test of time and has continued to develop and reinvent itself. 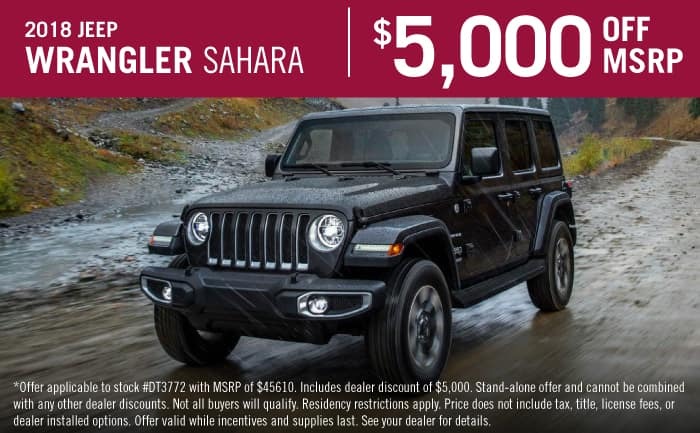 In this redesigned, 2018 Wrangler, the four available trim models give you the features you’ve been looking for with the classic design that you’ve always loved. The reason why people keep coming back to Jeep is because of the dedication to capability and power. Those two features can easily be seen in the 2018 Wrangler, and the model options really drive the uniqueness of this SUV. If you’re interested in learning more about the four models offered with the 2018 Wrangler, then keep reading below! There are two major configurations of the Wrangler, a two-door option, and a four-door option. Both of those configurations come with this base trim Sport, along with the Sport S, and the Rubicon. Standard features of this model include a one-piece folding rear seat, 17-inch steel wheels, a tilt-and-telescoping steering wheel, a full-size spare tire, cloth upholstery, skid plates, a height-adjustable driver’s seat, tow hooks, cruise control, fog lights, manual mirrors and locks, and a fold-down windshield. You’ll also get features like an auxiliary audio jack, a 5-inch Uconnect touchscreen display, a USB port, Bluetooth, an 8-speaker sound system with a CD player, and a rearview camera. If you get the Unlimited (4-door) version, then you’ll also add air conditioning, a larger gas tank, and a 60/40-split folding rear seat. The standard engine is a 3.6-liter V6 engine that can create 260 lb-ft of torque and 285 horsepower. A six-speed manual transmission comes standard, with an 8-speed automatic transmission as optional. The next model available, which can come in the 2-door or 4-door configuration, is the Sport S. This model builds upon the Sport, and includes sun visors with vanity mirrors, 17-inch alloy wheels, a leather-wrapped steering wheel, air conditioning, an alarm, automatic headlights, power windows and locks, keyless entry, and heated power mirrors. This model is special as it only comes in the four-door configuration. It also adds standard features like satellite radio, 18-inch alloy wheels, Apple CarPlay, painted exterior body panels and trim, Android Auto, automatic LED headlights, a 7-inch touchscreen, LED fog lights, an additional USB, automatic climate control, a bigger driver information display, and a 115-volt outlet. The final available model, offered with the 2- and 4-door configurations, is the Rubicon. This trim is highly-capable when it comes to off-roading. It adds features like an additional USB port, 17-inch alloy wheels, an electronically disconnecting front roll bar, special off-road tires, electronic front and rear locking differentials, a heavy-duty Dana M210 front axle and an M220 rear axle, 4.0-to-1 low-range gearing, and shorter 4.10 axle gearing. Some options you can add include a nine-speaker Alpine sound system, remote start, blind-spot monitoring, a heated steering wheel, an 8.4-inch Uconnect system, and leather upholstery. 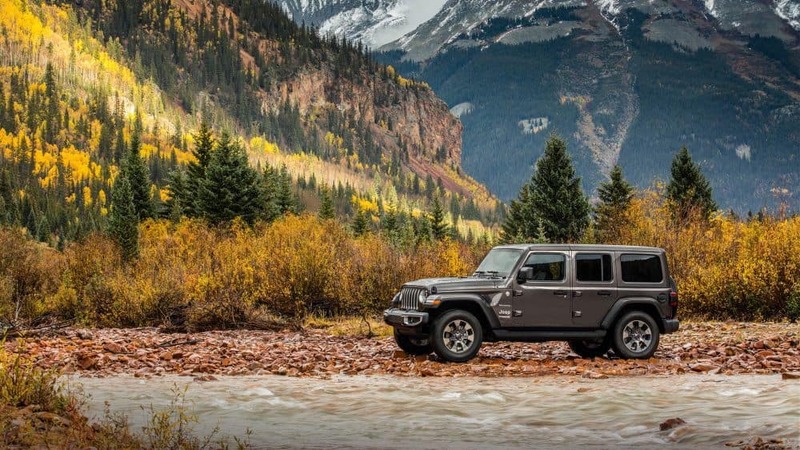 If you are looking for a reason to join the Jeep family, then you need to check out the all-new 2018 Jeep Wrangler! Our Wrangler inventory is full of options that we are sure will make you hungry for adventure. For more information, give us a call today.